MSC = SNAV whose only current overnight route is Split to Ancona using the Aurelia, which they've only just purchased after years of chartering. They could perhaps be looking to double up on that route. I love these multi-operator brochures. It's interesting to see that BF even then were not afraid to be more expensive on the supplements. 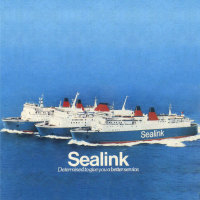 Sealink's Portsmouth-Cherbourg route doesn't feature in either, it never seems to have been particularly reliable but it did operate both these years. The AA produced Motoring Abroad brochures throughout the 80s which similarly listed all the options and also had adverts from all operators. They are wonderful period pieces. This is the Yamato, which Stena RoRo have bought for the charter market from Hankyu Ferry, delivery for conversion when she is replaced by one of the latest Hankyu pair, I think early next year. Looks like a bulldozer job is planned on her whoever she ends up operating for; sadly the plans suggest they will plate over her atrium and grand staircase which is the stand-out on board feature. Also no sign of them looking to increase the vehicle deck headroom. The pods are meant as an interim options between reclining seats and cabins and are not downgrading the cabin options (which Stena have recently been at the industry forefront of improving, albeit not on the Rostock route). I've been hoping, and on occasion encouraging, European operators to give this a go for years. And the two Rostock ships are the absolute dogs of Stena's passenger fleet with reclining seats squeezed into corridors and into obviously converted video games areas, so if any vessels would benefit from an interim option between seats and full cabins its them. What makes them work in Japanese ferries is that most passengers, no matter what their accommodation, use the communal baths and historically even most proper cabins wouldn't be equipped with en-suite facilities. Clearly this isn't the case in Europe so presumably Stena will install suitable public showers for people to use. These are amongst the very few modern cruise ships which (to me) are appealing in size and not finished in appallingly bad taste. Bit shocking to see some of the on board videos. e.g. Balearia don't know what ships will be doing what yet this summer - they've made mass schedule changes three times in the last month alone - so there's no guarantee it will be the Scilla as opposed to the Napoles or the Hedy Lamarr. Doubtful to be one of the higher-spec newbuild Visentinis though. The interior design of the WBY was by Steen Friis, who also did things like the Maersk Ds, Stena's rather nice Killingholme ships, and knocked the Hammerodde and Dueodde into shape to make them vaguely appealing compared to the rather horrible Ben my Chree from which they were derived. The design approach for all those vessels is for them to be modern, quite elegant but distinctly understated which is an approach carried onto the WBY. Closer to home, Steen Friis also did the Dana Sirena in her original DFDS guise, and their masterpiece was supposed to be the Norman Leader where the company was responsible for softening her brutal exterior lines, looking after the entire interior, the graphic design including signage plus developing LD Lines' corporate identity. I quite like the Yeats - although she could do with a bit more colour, the approach is rather more sophisticated than the absolute monocrhome applied to things like the DFDS North Shields ships in their most recent guises. Certainly dispensing with things like the awful, vast Irish pub on the Ulysses is a step forward. But the compromises between her short sea and long-distance modes present themselves in things like the absence of a proper show bar, a place for entertainment or a proper kids play area. She's quite nice for three or four hours but a long crossing to France...? Perhaps less so. I've not suffered any significant disruption in France. I think it's overblown and most of the incidents, gilets jaunes apart, reflect the traditions of a country which allows the powerless as well as the powerful to have a real say in society. Try getting around the UK by train though... on this basis I imagine there would be legitimate reason for foreign governments to recommend avoiding travel in England. They were the same/similar as built (the X didn't have the port side passenger loading ramp as the northern Superfasts were expected to use gangways whereas the Cap (V) loaded her pax over the stern); the X's arrangements were changed when she became Seafrance Moliere, with the new smaller opening offset from centreline, presumably to fit Dover. The Cairnryan ones still have pretty much their original arrangement I think. The Europe is Fishguard registered, the Adventurer in London and the Cairnryan and Birkenhead ships all in Belfast. The wider Stena group use the UK registry quite widely and are one of the biggest operators of British ships by tonnage, including drillships and tankers - somewhat eccentrically the Stena Crystal Sky and Stena Clear Sky are registered in Stranraer. Regrettably it looks like post-Brexit most of this fleet will be re-registered elsewhere.